For Stefan’s complete article on fungicide applications, please read the attached document. Successful on-line crop forecasting tool Yield Prophet® now has its own app. Launched by Birchip Cropping Group (BCG) on June 12, the Yield Prophet Lite app is a free tool that lets farmers estimate their potential crop yields based on forecast rainfall probabilities for the rest of the season. BCG Yield Prophet co-ordinator Tim McClelland said the app, which had been developed in partnership with CSIRO, uses data from the Bureau of Meteorology’s highly-regarded POAMA/ACCESS seasonal forecasting system to predict how the season might finish and likely crop yields. “The app can be used to help farmers to work out their potential yield and how much fertiliser is needed to meet that target,” he said. The app can be run at any time during the growing season. All growers need to do is specify their crop type (wheat, barley, canola or oats), select the closest Bureau of Meteorology weather station, and input some quick details about rainfall, starting soil nitrogen, water and carbon, and any nitrogen applications. The app will then calculate a range of water and nitrogen-limited yield potentials for your crop, and tell you the likelihood of different future rainfall amounts for the rest of the growing season. “Yield Prophet Lite is quite simple to use,” Mr McClelland said. Yield Prophet Lite has been developed from the Yield Prophet on-line platform which has the ability to generate reports for individual paddocks detailing real-time crop progress and potential according to the moisture and nutrient status of the soil. 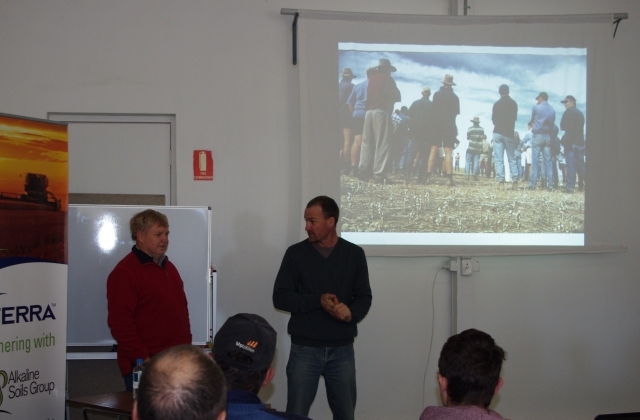 “Yield Prophet Lite gives growers a taste of what a full Yield Prophet subscription can offer,” Mr McClelland said. The Yield Prophet Lite app for iPads can be downloaded from the iTunes store. Android, iPhone and PC users can use the app via the web at: http://www.yieldprophet.com.au/yplite. For more information about the free Yield Prophet Lite app, or to find out how to subscribe to access the full Yield Prophet® decision-support platform phone BCG on (03) 5492 2787 or email yieldprophet@bcg.org.au. Returning as chairperson for the fourth year is Matthew Pointon, ably assisted by Vice Chairperson, Pete Treloar. Richard Way continues in his role as treasurer. Committee members include Stefan Schmitt, Will Pitts, Julie Page, Adam Cook, Andrew Slater, Tom Short, Bill Moloney, Richard Dodd, Bronte Blyth and David Linke. Trial sites for ‘Monitoring Improved Soil Health in Full Stubble Retention Systems’ will be set up in December. This new funding is worth over $50000 for 18 months of regular monitoring of soil fertility across six sites. The aim is to increase farmers and agronomists understanding of long term soil health changes since adoption of conservation farming practices. This will increase sustainability through improved use of fertilisers particularly nitrogen fertiliser applied during the season. This clear illustration should show the benefits of long term no till and stubble retention, and hopefully through improved soil health the shift to conservation farming will continue, especially adoption of newer technologies such as disc seeders, controlled traffic and inter row sowing. YPASG Agricultural Studies Bursary Now Available! YPASG supports future Ag students with $500 bursary. The YPASG committee recently decided to support young people in the agricultural industry by funding an annual bursary, offering support to young students about to embark on an agricultural (or related science) degree. “The bursary will be an amount of $500 and can be used to ease the transition from school to university life,” said YPASG Chairperson, Matthew Pointon. Year 12 students completing school at any Yorke Peninsula school in 2013 and intending to go on to university to study agriculture, are eligible to apply. “We ask that applicants write a 250 – 500 word statement of their future career aspirations and how the bursary will benefit them,” said Matthew. Landmark agronomist and YPASG member, Angus Calder, graduated from Roseworthy College with a double degree (Bachelor of Agriculture and Bachelor of Natural Resource Management) in 2009. As a former struggling student, he encourages any eligible upcoming uni student to apply. “It is a very positive time to be joining the industry and there are many fantastic opportunities for anyone looking to study agriculture. We are lucky to have some some great rural science courses at South Australian universities and I couldn’t be happier with my decision to study what I did,” Angus said. For further details, contact Kristin McEvoy (YPASG Project Coordinator) on projects@alkalinesoils.com.au. Details also available on the YPASG website, www.alkalinesoils.com.au. YPASG Livestock Group Workshop 3 featured Dr Lyndall Short discussing the importance of trace elements in sheep and how to interpret appropriate levels in blood tests. 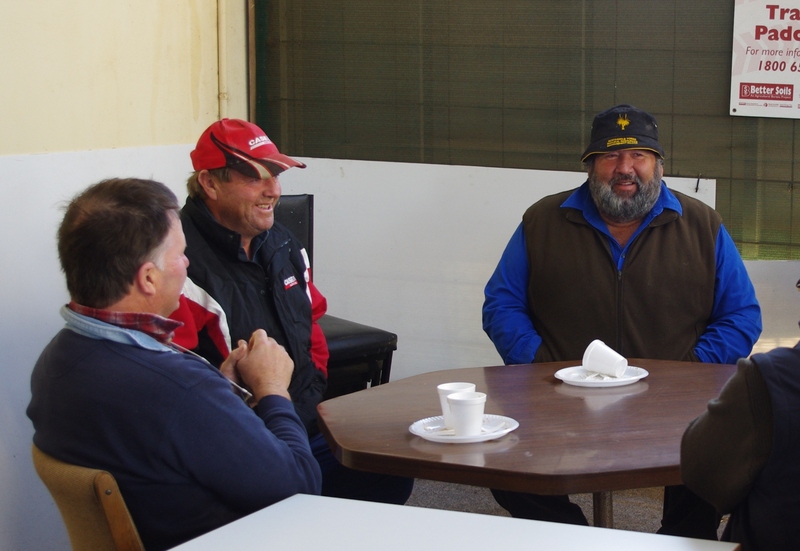 Since last meeting, Lyndall took tests from the sheep of several members and discussed the results in relation to the feed, age and condition of the sheep tested. Adequate trace element nutrition has very significant implications of growth, reproduction, immunity, lactation as well as production of fibre and meat in livestock. Copper, cobalt, selenium and occasionally iodine are of most importance in production animal systems. Take home messages included 1/selenium is perhaps not as low on YP as we are led to believe (or we are supplementing sufficiently), 2/ there are copper deficient areas close to the coastal regions of YP, 3/ Vitamin B12 supplement is essential all year round, 4/ you cannot tell which trace element is lacking in stock as clinical signs are similar, therefore blood testing is essential. Blood testing also provides a better understanding of your flock levels of trace elements are considering any treatments being used and is a valuable tool in assessing for deficiency or toxicity. Blood testing allow implementation and monitoring of future supplementation programs, improves fertility and growth aspects of flocks where deficiency is a problem and makes farming systems more profitable by improving animal health. 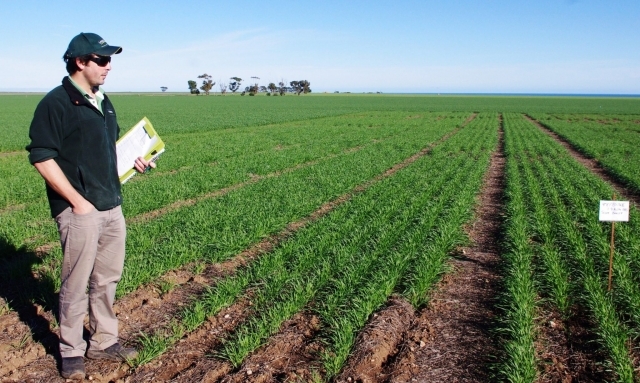 This exciting trial, funded by GRDC, took place from the 12th to the 16th of August. Four spreader types – Amazone, Kuhn, Bogballe and Vicon, along with ute spreaders were part of an intensive study in combination with snail bait varieties, Meta, Metarex, Slugga and Slugout to assess the efficiency and spread combinations. Weather conditions were also taken into account with a weather station set up in the paddock. 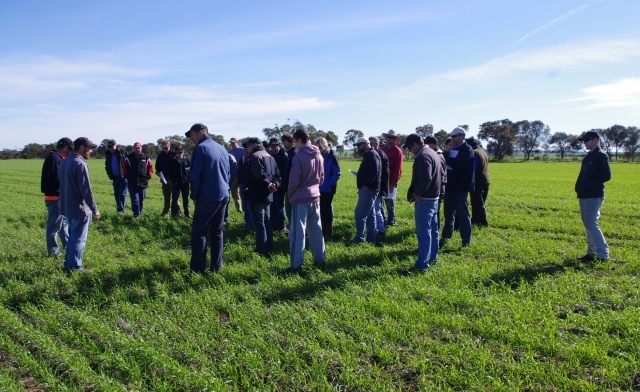 Russell Nichol attended from Victoria to input data and create result graphs, along with GRDC reps, Adelaide University staff, SARDI scientists, spreader company representatives and YPASG staff. The testing took place entirely on Ashley Wakefield’s property with results to be written up in Ground Cover and distributed to YPASG as soon as they are available. There have been major changes since Alkaline Soils first event the “Stalking Snails Day” in 2000. However snails have continued to spread across SA and snails were a major problem in Southern Australia in 2010- 11. After comparing weather patterns and snail populations since 2000, and also studying SYP farmer Mark Bennett’s 2010 snail control practices. It became obvious there is an opportunity to improve snail control through better monitoring of February March snail movement. Mark baits snails as soon as he sees snail slime on bare soil areas, eg. around gateways. In 2010 there was significant rainfall on February 18th & 19th , March 8th and March 19th to 21st . Significantly better snail control was achieved in areas that Mark baited within a few days of the 19th of March rain. I am currently working with SARDI, SA Uni and YPASG to monitor snail behaviour 24 / 7 using remote time lapse cameras. Following a hot dry summer White Italian snails were observed mating at Wild Dog Hill road Warooka on March 27 and March 30 during very light showers of rain. Snails were active at Warooka during late March early April, moving about one metre, coming across bait with minimum moisture eg light drizzle, overnight fogs and dews. Snails moved from two to three metres during and following the April 21 rain event. White Italian snails began egg laying at Warooka on Sunday 21st of April during a 12 mm rainfall event and continued to lay eggs during subsequent moisture events. White Italian snail egg clusters were smaller than usual and egg laying stopped when they reached dry soil during the April 21 egg laying. Conical snails were observed mating a fortnight later than the White Italian snails. Pick an area with high snail numbers and monitor snail movement over the February to May period to optimise snail control. Do not assume snails are idle because you do not see them moving during daylight hours.